28 February 2003 - The Wurzels at McClusky's, The Pithay, Bristol. Doors open 5.30pm; Wurzels on stage at 10.30pm. Entry £5.00 b4 9pm. 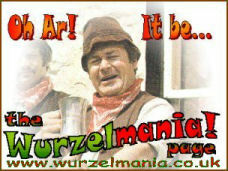 Thursday 6th March 2003 - The Wurzels at Mr Kyps, Parkstone, Poole, Dorset (01202 748945). Tickets �10.00 from the venue. Sunday 30th March 2003 - The Wurzels (7.30pm) at The Pavilion, The Esplanade, Exmouth, Devon EX8 2AZ (01395 222477) Tickets £10.00 each. Book by telephone using Switch/Visa, Mastercard or debit card (£1.00 extra charge for this service). Or send cheques payable to EDDC to the above address. 14th June 2003 - The Wurzels (8pm) at East Somerset Railway, Cranmore, Somerset Ticket price �10.00 only available in advance. There will be a bar and bbq. 22nd June 2003 - The Wurzels (noon-6pm) at Family Fun Day at Hornets RFC, Hutton Moor, Weston-super-Mare, Somerset. Tickets �6.00, accompanied U14s free! Large funfair, beer tent and food outlets, plus other attractions. Saturday 12th July 2003 - The Wurzels (1pm-11pm) at Summer Extravaganza at Clevedon Community School, Clevedon, Somerset. Attractions include funfair, sidestalls, craftfair, paintball range and climbing wall. Children have their own area with bouncy castles, ball pond and magic shows. Arena entertainment including a historical re-enactment of American Civil War and Tug Of War (to enter please phone 01275 876744). Live music stage with four live acts including The Wurzels (on stage around 6.30pm). Firework finale. Entrance Fee �2.00 before 5pm / �3.00 after 5pm. Under 5's �1.00. free parking. 'The Cheapest Place To See The Wurzels In 2003!' For more information please contact Jim Smith on 01275 876744." 18th July 2003 - Ray Lewis & the Drifters, The Wurzels, The Plonkers and Steve Bulley (Orchard FM) at Music On The Moors at Godney Farm, Godney, Somerset. Charity fundraiser for The Masqueraders CC. 27th July 2003 - The Wurzels at Watchet Festival, The East Quay, Watchet, Somerset. Free entry; contact Mark or Jackie on 01984 639616 for more details. 9 August 2003 - The Wurzels at Carlonnon Farm, Dunloe, Liskeard, Cornwall. Cancelled!